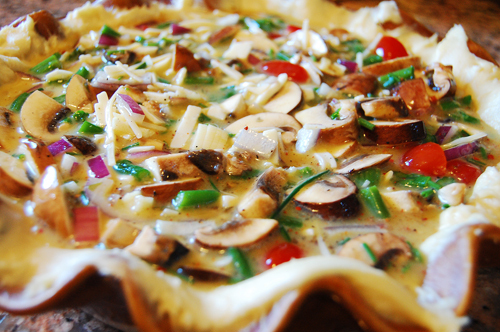 I set out this afternoon to make a quiche with asparagus and wild mushrooms. I thought, so seasonal! So local! So delicious! But, being me, I can never leave well enough alone. When I got home with my groceries for the week I thought, well, I can add some chives from Tuesday’s dinner, some green onion from Wednesday night’s dinner, some cherry tomatoes from Thursday night’s dinner (I know, not seasonal). I kept adding until it was this mass of vegetables floating in egg. I’m not complaining. With the exception of the tomatoes (for which you can substitute dried), this dish is a symphony of spring flavors. 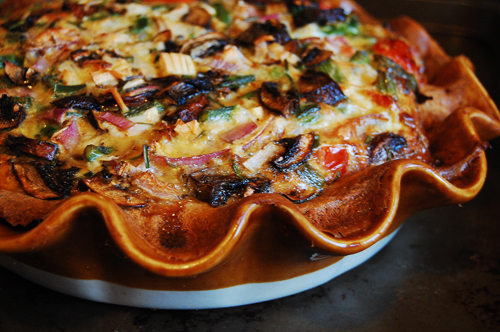 The thing that I love about quiche is that it is hearty and light at the same time. The vegetables danced in the fluffy eggs, and paired with a rich crust it is the perfect anytime meal. Great for brunch, great for dinner. Great for life. Since that’s pretty much all I have to say about the quiche (except try it, it’s awesomely vegtastic), I thought I’d wax poetic about my newest accomplishment. It’s not really an accomplishment yet, more like a lead to what I hope will be an accomplishment- I think that I’ve found a way for us to have a garden. I’m exploring my options between community gardens in Baltimore City and yard sharing through a site called hyperlocavore. 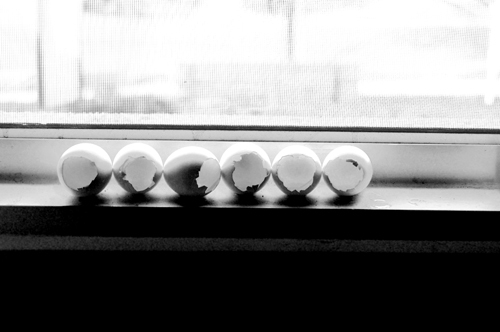 Either way I have my heart set on gardening this season so I’m planting seeds (a little late) in these egg shells. In the past we’ve wrestled with the biodegradable planting pots, which never seem to totally degrade, so I’m excited to try planting in egg shells. It’s composting and gardening at the same time. Wish me luck. Prep all vegetables. 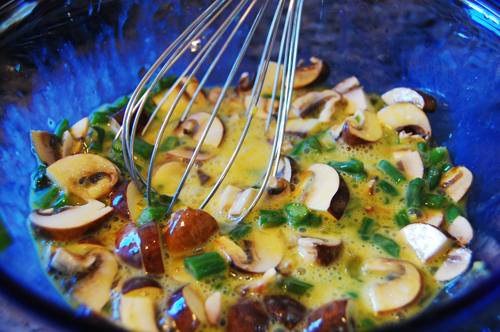 Whisk together eggs, milk, and cheeses. Stir in vegetables and spices. Spread crust out into pie pan and pour mixture into it. Bake at 350 for 1 1/2 or until solid and golden brown. Let sit 10 minutes. Enjoy. Just wanted to say I really liked the post. You have really put a lot of time into your posts and it is just wonderfull! Have you had any luck finding a yardsharing partner? I ended up getting a plot in a community garden!